This week’s Leaven is a special issue focusing on where people pray and how it helps their spiritual life. One story you won’t find in this issue is one on Stan Schmidt. I met Stan last summer as I was going around interviewing my “prayer people,” as we came to call them. Stan was a gracious host and a great interview. Our original plan was to publish this special prayer issue in the fall of 2015. Unfortunately, The Leaven lost two staff members last summer — reporter Jessica Langdon and advertising representative Julie Holthaus. Suddenly, Joe Bollig had to double his efforts as a reporter and I had to take over advertising (I apologize to anyone whose ad I screwed up — it was a crazy time). In the meantime, the special issue got pushed to the backburner until we could get two new people hired and trained. In February of this year, we picked up the pieces of the special issue and began to move forward with it. Stan was one story I had written last summer, so I contacted him via email to make sure he was still ok with being featured in The Leaven and to make sure his situation had not changed. After a couple weeks of hearing nothing back, I did some digging online that revealed that Stan had died on Nov. 7, 2015. I was shocked. He was only 58 and despite having suffered a horrific accident in 2009 that left him disabled, he seemed so full of life. Although, after some discussion, we decided not to include Stan’s story in the newspaper, this blog seemed the perfect place for it. So below you will find the story I wrote on Stan Schmidt before he died. Rest in peace, Stan. WAMEGO — Stan Schmidt was a workaholic — and it wasn’t a good thing. Life was passing him by, and there wasn’t a thing he could do about it. He had to work. Then, suddenly, life took a tragic turn. That accident broke his back, his shoulder, and dislocated his jaw. Suddenly, the workaholic couldn’t work. He was disabled and needed to channel his energies elsewhere. He started with prayer. 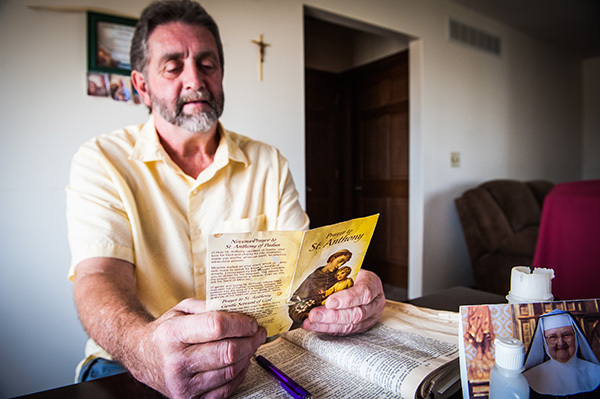 His house is littered with prayer cards, prayer books, religious CDs, and a very worn Bible. The TV is turned to EWTN, religious music plays in the background and a photo of Mother Angelica sits on his kitchen table. Schmidt starts his day by attending Mass. He also participates in the parish’s adoration hour on Wednesdays. While driving, he will plop in a rosary CD and pray along. The majority of his day is spent in prayer. Now Schmidt gets to spend time with his children and grandchildren. Despite his disability, he finds a way to hold, hug, play and pray with them. Stan was my 1st cousin and his mother was my God Mother. Although we lived over a hundred miles away and didn’t see each other often, he always knew who I was and we always had good visits. Thank you for sharing the interview. May God bless him and his family and that he RIP.